The tree is mightier than the car, it seems. 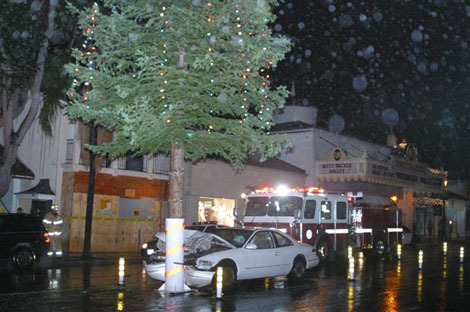 An allegedly intoxicated driver slammed her car into the 50-foot Christmas tree stationed in the middle of State Street in front of the Arlington Theater at about 12:50 a.m. on Friday, December 7. 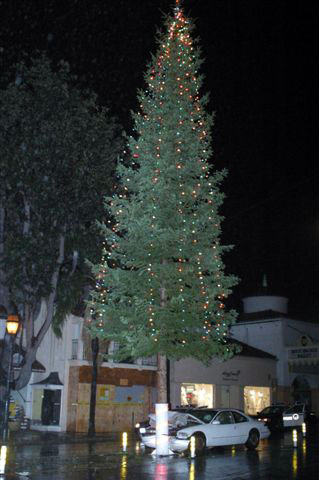 According to a report from Santa Barbara Police spokesman Paul McCaffrey, a woman driving south on State Street became confused when she saw the tree’s festive lights. “She didn’t see the tree, and believed the lights were strung between the buildings,” McCaffrey said in a statement. The woman’s Lincoln Mark VIII slammed into the tree’s metal sheath. Though the car sustained major damage, the tree “appeared unscathed,” in McCaffrey’s words. “Fortunately, the tree appears able to continue service throughout the holiday season,” McCaffrey wrote. The driver was arrested for driving under the influence of drugs or medication.